The majority of the spice from hot peppers comes from a plant compound called capsaicin. The most obvious indicator of capsaicin's presence is the burning, tingling sensation it produces on your skin or tongue when you touch or eat hot peppers. While capsaicin is associated with a number of health benefits, too much can cause irritation to your digestive tract. New York University Langone Medical Center states that capsaicin is generally considered safe to use in the amounts common in food. Scientific studies using red pepper often included supplements of roughly 2.5 grams of hot peppers per day -- between an eighth and a quarter of a jalapeño pepper. Cayenne supplements, which contain capsaicin, taken as a medical treatment can safely be consumed at 0.5- to 1-gram dosages three times a day, although they should be taken before meals. Different chili peppers contain varying levels of capsaicin, as some hot peppers are spicier than others. The hotter the pepper, the more capsaicin it has. Milder chili peppers, such as ancho chilies or mild jalapeños, will have less capsaicin but may be more readily tolerated by those who are not used to consuming spicy foods. Hotter peppers include Thai bird's eye chili peppers and habanero peppers, common in Southeast Asian and Caribbean cuisines. Eating capsaicin can cause some side effects, including an upset stomach and stomach pain. In some cases, it can also cause diarrhea, as well as sweating, flushed skin, a runny nose and tears. 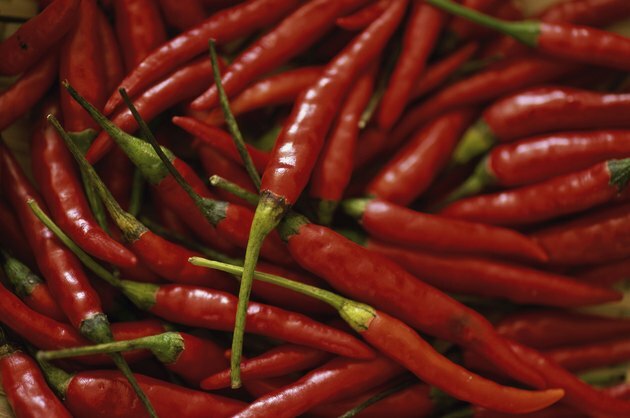 If you consume capsaicin regularly, it can lead to stomach irritation. Capsaicin often produces feelings that are similar to stomach pain, although there is no scientific evidence that it causes actual damage. Because capsaicin does cause irritation of the mucous lining in your digestive tract, high levels of capsaicin intake can lead to vomiting and nausea, especially if you are not used to spicy foods or have a capsaicin intolerance. Similarly, if you suffer from either heartburn or ulcers, consuming high or even moderate levels of capsaicin can increase the severity of the symptoms but will not cause either heartburn or ulcers. Building up your tolerance for capsaicin can mean you experience fewer side effects when eating very spicy foods. If you are not used to spicy foods at all, start with only mildly spicy peppers, such as pasilla chilies. Mild chilies will give a slight tingle and often a welcome fruitiness to a dish. You can also reduce the heat in chili peppers by removing the seeds and veins -- the white portion on the inside of the pepper -- because these parts contain the highest concentration of capsaicin. Last, temper your chili intake by combining it with naturally sweet or sour foods, such as by adding hot peppers to a mango salsa. The sugar from the mango and the sourness of the lime juice will alter the taste of the chili. Acids boost the natural fruitiness and brightness of chilies, while sugar helps mellow out their heat. Can Peppers Damage the Esophagus?